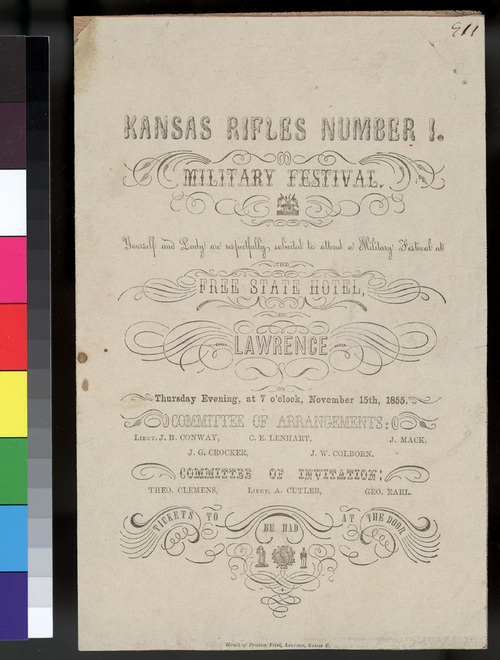 This invitation is to a military festival to be held on November 15, 1855, at 7:00 p.m. at the Free State Hotel in Lawrence, Kansas Territory. The committee of arrangements consists of Lieut. J. B. Conway, E. E. Lenhart, J. Mack, J. G. Crocker, and J. W. Colborn. The members of the committee of invitation are Theo. Clemens, Lieut. A. Cutler, and Geo. Earl (Earle? ).